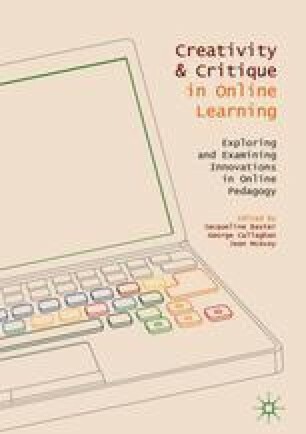 Since their inception in 2012 the most significant challenge faced in producing and presenting Massive Open Online Courses (MOOCs) has been engaging and retaining learners. Although often heralded as an evolutionary step in online education, MOOCs struggle with retaining students to the completion of a course. This chapter explores some of the issues through a focus on the design of one MOOC (Forensic Psychology: Witness Investigation by The Open University on the FutureLearn platform) which utilised a narrative approach, with a storyline running throughout, and a serialised release. Analysis revealed a relatively high retention rate with narrative devices appearing to entice learners to return the following week to find out what happened next. Implications for learning design and development of MOOCs are discussed. Downes, S. (2007, January 3). What connectivism is. Half an Hour. http://halfanhour.blogspot.co.uk/2007/02/what-connectivism-is.html. Accessed 3 Apr 2015. Hirst, T. (2009). Non-linear uncourses – Time for linked ed? http://ouseful.wordpress.com/2009/01/30/non-linear-uncourses-time-for-linked-ed/. Viewed 04 Feb 2015.